Bolivia is a poverty-stricken, landlocked nation in north-central South America. Although it won its independence in 1825, Bolivia was ruled as an oligarchy for over a century, as the majority Quechua and Aymara Indian populations were brutally exploited in mines and on plantations and denied political and civil rights. Since 1985, however, democratic elections have chosen Bolivia’s governments. Although poor, Bolivia is blessed with abundant natural resources, including tin, oil, and natural gas. Bolivia is also the third largest producer of coca, the plant from which the drug cocaine is derived, and is hence deeply involved in transnational anti-narcotics efforts. Lay of the Land: Bolivia is a landlocked country sitting astride the Andes in western South America. It is bordered by Brazil to the north and east, Paraguay and Argentina to the south, and Chile and Peru to the west. With an area of 424,135 square miles, Bolivia is about 1½ times the size of Texas, and ranks 28th in the world. There are two principal geographical divisions. In the west the altiplano, a high, cold, windswept plateau 500 miles long by 80 miles wide lying at a 12,000 foot elevation, is home to four fifths of the population, including the capital city of La Paz, a metropolitan area of 1.4 million people. In the east lie the sparsely populated lowlands, which include hardwood forests, valleys, and the scrubby plain called the Chaco. Lake Titicaca, the highest navigable lake in the world at 12,507 feet, is on the border between Peru and Bolivia. Religions: Catholic 78%, Protestant 16%, Ethnoreligious 3.8%, Baha'i 2.2%. Languages: Spanish 40.0% (official), Quechua 33.3% (official), Aymara 20.5% (official), Guaraní 0.5%. There are 36 living languages in Bolivia. Bolivia has been inhabited since at least 11,000 BC. Before the arrival of the Spanish, the Inca Empire of the Quechua people dominated most of Bolivia, including the previously powerful Aymara people. The Inca, however, were not able to conquer the nomadic peoples of the eastern lowlands of Bolivia. After the Spanish conquest of the Inca in 1533, the Bolivian portions of the empire were gradually added to Spain’s domain, although the Spanish, like the Inca, were unable to establish full control of eastern Bolivia. The Spanish founded the city of La Paz in 1548. Under the Spanish, Bolivia, or “Upper Peru,” was part of the viceroyalty of Peru and was ruled from Lima. The Spanish derived great wealth from silver mines in Bolivia, in which they brutally exploited the Quechua and Aymara by forcing them to work under inhumane conditions, thus beginning a long history of hostility between Bolivia’s rulers and its indigenous population. Bolivia declared independence in 1809, but fought a 16-year war to make independence an actual fact. Independence, however, did not bring stability. For nearly 60 years, coups and short-lived constitutions dominated Bolivian politics, followed by a succession of governments controlled by economic and social elites that followed laissez-faire policies through the first third of the 20th century. The living conditions of the indigenous Aymara and Quechua peoples remained deplorable. Forced to work under primitive conditions in the mines and in nearly feudal status on large estates, they were denied access to education, economic opportunity, or political participation. The Bolivian National Revolution of 1952 aimed to reform those conditions, and introduced universal adult suffrage, carried out sweeping land reform, promoted rural education, and nationalized the country’s largest tin mines. The Revolution also, for the first time in Bolivian history, attempted to incorporate into national life the Aymara and Quechua peasants who together constituted at least 65 percent of the population. A conservative military coup in 1964 initiated about 20 years of military rule, which ended with elections in 1985. At that time, Bolivia was in a state of severe crisis: economic output and exports had been declining for several years and hyperinflation had reached an annual rate of 24,000%, while social unrest, chronic strikes, and unchecked drug trafficking were widespread. For the next 18 years, urged by the International Monetary Fund and World Bank, Bolivia’s government pursued neoliberal economic policies, such as privatizing state enterprises. These policies met increasing resistance, especially after the discovery of huge natural gas reserves led to conflict over their ownership and management. In October 2003, President Gonzalo Sánchez de Lozada ordered security forces to forcibly end protests near La Paz, and about 60 Bolivians were killed. In the ensuing uproar, Sánchez de Lozada resigned his office and fled the country. In 2005, one of the organizers of those protests, Evo Morales, was elected President of Bolivia by the widest margin of any leader since the restoration of civilian rule, becoming the first indigenous person to be elected President of Bolivia. In April 2007, the Bush administration granted asylum to Sánchez de Lozada. Relations between the United States and Bolivia have been, for the most part, friendly and cooperative, though there have been several periods, usually after forcible seizures of power, when the U.S. has refused to recognize the legitimacy of those wielding power in Bolivia. In 1991, the United States forgave more than $350 million owed by Bolivia to the U.S. Agency for International Development and the U.S. Department of Agriculture. hough President Morales has been publicly critical of U.S. policies, the two countries have maintained their tradition of cordial and cooperative relations. Raquel Welch- Actress known for bombshell roles in the 1960s and 1970s, is of Bolivian descent on her father’s side. Jaime Escalante- Educator who gained notoriety in the early 1980s for his success working with underprivileged youth in Los Angeles. He has received numerous awards and his story was featured in the movie Stand and Deliver. The control of illegal narcotics is a major issue in U.S.-Bolivian relations. For centuries, Bolivian coca leaf has been chewed and used in traditional rituals, but in the 1970s and 1980s the emergence of cocaine as a popular recreational drug among Americans led to a rapid expansion of coca cultivation. In 1988, a new law recognized only 12,000 hectares as sufficient to meet the licit demand for coca and called for the gradual eradication of all “excess” coca. This forced eradication remains controversial, however, and well-organized coca growers unions blocked roads, harassed police eradicators, and occasionally used violence to protest the policy. The Morales government has embarked on a policy of voluntary eradication and social control, and plans to expand, at least for a limited time, legal coca production to 20,000 hectares. Although the U.S. prefers lower long-term limits, it continues to support counter-narcotics efforts in Bolivia, as the 20,000 hectare proposal is still significantly below current cultivation, which has oscillated between about 23,000 and 28,000 hectares since 2001. There are approximately 40,000 Bolivians living in the United States, concentrated on the West Coast, Northeast, and Gulf States. While a large number of Bolivians arrive in the U.S. every year (22,785 in 2006), only a small number become naturalized citizens. Because of this, the actual number of Bolivians living within the U.S. is difficult to ascertain. One survey from the early 1990s estimated that 40,000 Bolivian-Americans live within the vicinity of Washington D.C., alone. If those figures still hold true, then the number of Bolivians living in the U.S. would be much higher than 40,000. The largest Bolivian communities are in Los Angeles, Chicago, and Washington D.C. Viewing the relationship from the other side, 37,758 Americans visited Bolivia in 2005, which is consistent with the numbers between 2002 and 2005. About 13,000 Americans live in Bolivia, almost exclusively in La Paz, Santa Cruz, and other cities. Bolivia has the lowest GDP per capita in South America, and is the second poorest country in the Western Hemisphere after Haiti. Although rich in natural resources, especially oil, natural gas and metals, Bolivia is the poorest country in South America, with 63% of its people living in poverty. Energy self-sufficient Bolivia meets its small but growing energy needs with oil and natural gas, both of which the country has in abundance. About 40% of the labor force works in agriculture, but this sector accounts for only 18% of GDP. Brazil is Bolivia’s largest trading partner, followed by Argentina and the United States. In 2007, U.S. exports to Bolivia totaled $277.7 million, dominated by machinery and telecommunications equipment ($129.3 million or 46.5%), consumer goods ($33.2 million or 12%) and food ($27.7 million or 10%). In the same year, U.S. imports from Bolivia totaled $362.6 million, mainly metals ($95.3 million or 26.3%), jewelry ($73.2 million or 20.1%), oil and other fuels ($66.3 million or 18.2%), and food ($36 million or 10%). Although the trade in cocaine is not officially tracked because of its illegality, it adds tens of millions of dollars to the Bolivian economy. The U.S. gave $133.8 million of aid to Bolivia in 2006. In an effort to reduce the coca industry, the largest recipient program was counter-narcotics ($74.8 million), which included Alternative Development and Livelihoods ($31.7 million), Interdiction ($19.7 million), and Eradication ($16.9 million). Other large recipient programs include Maternal and Child Health ($10.2 million), Local Government and Decentralization ($8 million), and Natural Resources and Biodiversity ($6.1 million). Bolivian President Evo Morales announced that he will expel U.S. Ambassador Philip Goldberg after accusing Goldberg of supporting rebel groups in eastern Bolivia. U.S. authorities denied the charge. The U.S. Embassy in Bolivia asked Peace Corps volunteers and a Fulbright scholar to spy on Cubans and Venezuelans in Bolivia, a clear violation of U.S. policy. The U.S. wants Bolivia to restrict coca farming drastically, but the Morales administration is doing so gradually to reduce the financial impact on poor farmers. Morales praises coca growers for kicking out U.S. agency (Associated Press). Bolivia is seeking to prosecute former Bolivian defense minister Carlos Sanchez Berzaín and former President Gonzalo Sánchez de Lozada, both of whom fled to the U.S. in 2003, for their involvement in the October 2003 killing of about 60 protesters. Bolivia is a constitutional, multiparty democracy. Although Bolivia has a past history of serious human rights abuses by the government, the situation has improved somewhat in recent years. Elections since 1985 have been generally free and fair, including the December 2005 elections, when Bolivians elected Evo Morales, leader of the Movement toward Socialism (MAS) party, as president in a landslide. The civilian authorities generally maintain effective control of the security forces. The mandate for the Constituent Assembly (CA) elected in July 2006 to rewrite the country’s constitution was extended from August 6, 2007, to December 14. An inability to work out a compromise between the MAS and opposition parties led to severe and occasionally deadly clashes between their respective supporters. On December 9, 2007, when the CA reconvened, the MAS and representatives from allied political parties approved a new draft constitution. Some opposition delegates boycotted the session, while others claimed they were prevented from attending it. The government announced it would hold a referendum for citizens to approve the draft constitution on December 7, 2008. While the government generally respected the human rights of its citizens, there were problems in some areas. The most significant human rights problems were abuses by security forces, including several deaths; harsh prison conditions; arbitrary arrest and detention; threats to civil liberties, including the right to a fair and public trial, and press freedom; corruption and a lack of transparency in government; discrimination based on gender and ethnicity; trafficking in persons; child labor; widespread poverty; and brutal working conditions in the mines. Note: Officially recognized on Jan 3, 1849. Appleton served as Assistant Secretary of State from 1851 to 1860, and as Ambassador to Russia from 1860 to 1861. Termination of Mission: Notified Government of Bolivia from Cobija Jun 30, 1851, of his impending departure. Termination of Mission: Notified Government of Bolivia of his departure by note from Tacna, Peru, on or shortly before Jan 18, 1854. Note: Dana was Governor of Maine from 1846 to 1850. Note: Cartter was a member of Congress from 1849 to 1853, and Chief Justice of the Supreme Court of Washington, D.C., from 1863 to 1887. Note: Commissioned during a recess of the Senate; recommissioned after confirmation on Jan 18, 1864. Note: Croxton served in the U.S. Army as a Brigadier General during the U.S. Civil War. Note: Commissioned during a recess of the Senate; recommissioned after confirmation on Feb 6, 1879. Note: Maney served in the Confederate States Army as a Brigadier General during the Civil War. Switching to the Republican Party after the war, he was ambassador to Colombia from 1881 to 1882, and to Uruguay and Paraguay from 1890 to 1894. Note: Commissioned during a recess of the Senate; recommissioned after confirmation on Dec 19, 1883. Note: Commissioned during a recess of the Senate; recommissioned after confirmation on Dec 21, 1887. Officially recognized on Jan 17, 1888. Note: Moonlight served as Governor of the Wyoming Territory from 1887 to 1889. Note: Commissioned during a recess of the Senate; recommissioned after confirmation on Dec 18, 1897. Officially recognized on Jul 4, 1898. Note: Commissioned during a recess of the Senate; recommissioned after confirmation on Dec 8, 1902. Note: Commissioned during a recess of the Senate; recommissioned after confirmation on Dec 10, 1908. Note: Commissioned during a recess of the Senate; recommissioned after confirmation on Jan 15, 1934. Termination of Mission: Normal relations interrupted, Dec 20, 1943; new Government of Bolivia still unrecognized by the United States when Boal left post, Feb 5, 1944. Note: Officially recognized on Nov 16, 1944. Note: Commissioned during a recess of the Senate; recess appointment expired Jan 2, 1951; recommissioned after confirmation on Jan 3, 1951. Reappointed Jun 26, 1951. Note: Commissioned during a recess of the Senate; recommissioned after confirmation on Jan 18, 1952. Note: Commissioned during a recess of the Senate; recommissioned after confirmation on Dec 3, 1954. Drew also served as U.S. Minister to Jordan in 1950, and as U.S. Ambassador to Haiti from 1957 to 1960. Note: Bonsal also served as Ambassador to Colombia in 1955, to Cuba from 1959 to 1960, and to Morocco from 1961 to 1962. He was the last U.S. ambassador to Cuba prior to the U.S. terminating diplomatic relations. Note: The Mexican-born Castro also served as ambassador to El Salvador from 1964 to 1968, and to Argentina from 1977 to 1980. He was the first Hispanic Governor of Arizona from 1975 to 1979. Name: William Perry Stedman, Jr. Termination of Mission: Normal relations interrupted Jul 17, 1980. The new Government of Bolivia had not been recognized by the United States when Weissman left post, Jul 20, 1980. Note: Alexander Watson served as Chargé d'Affaires ad interim, Jul 1980-Sep 1981. Note: Corr also served as Ambassador to Peru from 1980 to 1981, and to El Salvador from 1985 to 1988. Corr was investigated between 1986 and 1991 for possible involvement in the Iran-Contra scandal. He gave voluntary interviews to the Independent Counsel in 1991 before ending his cooperation and invoking his Fifth Amendment right against self-incrimination. Subsequently, a judicial order compelled Corr to testify and forced him to produce documents, under grants of immunity. Note: Gelbard also served as Ambassador to Indonesia from 1999 to 2001. Note: Kamman also served as Ambassador to Chile from 1991 to 1994, and to Colombia from 1997 to 2000. Note: Hrinak also served as Ambassador to the Dominican Republic from 1994 to 1997, to Venezuela from 2000 to 2002, and to Brazil from 2002 to 2004. Note: Greenlee also served as Ambassador to Paraguay from 2000 to 2003. Bolivia's Embassy Web Site in the U.S.
Bolivia's Embassy in the U.S.
Philip S. Goldberg presented his credentials to Bolivian President Evo Morales Ayma on October 13, 2006. Goldberg is a native of Boston and a graduate of Boston University. Before joining the Foreign Service, Goldberg worked for several years as a liaison officer between the City of New York and the United Nations and consular community. He Goldberg has served overseas as a consular and political officer at the U.S. Embassy in Bogotá and political-economic officer in Pretoria. 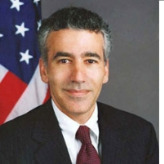 From 1994 to 1996 Goldberg was the Department’s Bosnia Desk Officer and a Special Assistant to Ambassador Richard Holbrooke. In the latter capacity, he was a member of the American negotiating team in the lead-up to the 1995 Dayton Peace Conference and Chief of Staff for the American Delegation at Dayton. Goldberg served as Special Assistant (1996-1998) and then Executive Assistant (1998-2000) to Deputy Secretary of State Strobe Talbott. In 2000, he was a senior member of the State Department team handling the transition from the Clinton administration to the Bush administration. He served from January to June, 2001 as acting Deputy Assistant Secretary of State for Legislative Affairs. He worked as Deputy Chief of Mission at Santiago, Chile, from 2001 to 2004, and then as Chief of Mission in Pristina, Kosovo, from 2004 to 2006. Goldberg speaks fluent Spanish.